Creating consistent content week in, week out, that’s engaging and you feel proud of is a huge challenge. I’ve definitely found coming up with content ideas tough, and i know many of the entrepreneurs I help have real trouble being creative and inspired with their content. It can feel like your business and audience are content hungry monsters. Everything needs content ideas, your blog, social media, courses, emails, websites, landing pages and and and. It goes on and on. There is such a huge focus on content because value packed content that leaves your target market wanting more is the best way to build your list, get your audience to trust you, attract more clients and ultimately make more sales. 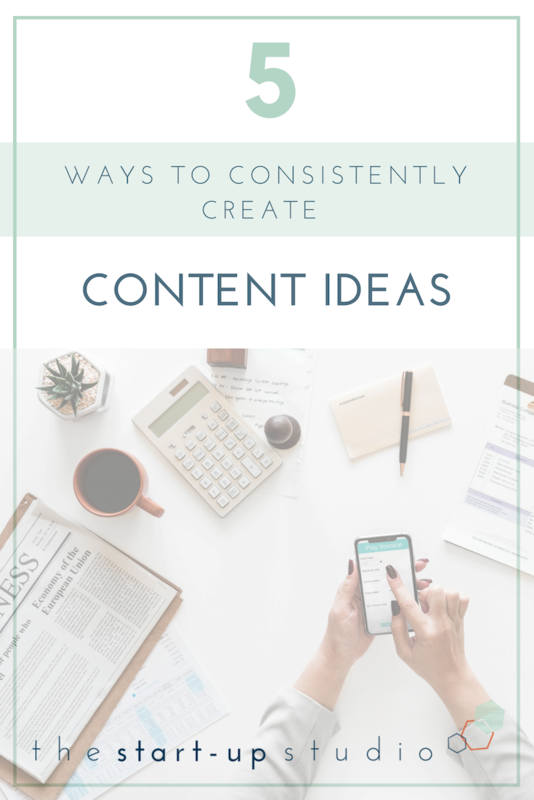 With so much to play for, i’m going to show you how to consistently create content ideas that’ll turn your audience into raving fans and paying clients. And you should definitely grab your free Secrets To High Converting Content workbook and start creating content your audience will love, share and act on. Download your free cheat sheet now. Break your business into different categories, for example my categories are inspiration, branding, goals & planning, content creation, content repurposing, Pinterest and many others. Come up with as many as you can, but at least 10. Research what your competitors are writing about and what content is popular on their websites? Use your experience. Think about the questions you always get asked, what help do your clients need? Write down all the topics you are passionate about and expert in. How and where do you want to add value? SEM Rush is a great tool to maximise the SEO potential of your content (and who doesn’t want that?). You put in a topic, press the magic button and it gives you a top 10 list of headlines based on backlinks. You can click through to the articles to see what your niche are writing about and also quote them in your own content. It also lists 10 questions, top sub topics and related searches for your search term. Brilliant. Answer the Public is a great free long-tail keyword research tool. You type in your topic and it generates a list of questions the public is actually asking about that niche. This helps to ensure your content is relevant and valuable. The key to growing your audience and engaging them is to create content they’re really craving. And the best way to know what they’re really craving is to ask them, nothing like getting it from the horse's mouth in their own words (although to be fair horses can’t talk but you get what I mean!!). The options are endless. Anything which allows you to hear directly from your target audience will be useful in creating content ideas. What topics do you enjoy most from me? What do you want to achieve in 3 months time? What would stop you from achieving your goals? If you have an idea for a general topic, pop it in the fountain of knowledge, Google, and look at the suggested topics it comes up with. Each could be a piece of content. Also check out the related searches at the bottom of the page. You can use Trello, Google docs or whatever you like and put in your ideas, frequently asked client questions, things you like from your competitors, trends. Basically anything that could be a potential content topic. Then when you sit down to write you’ll have a whole library of information to inspire you. You now have my proven techniques that I use for generating incredible content ideas my audience will love. Your next step? Set aside 30 minutes and start with tip 1 and you’ll have a host of ideas in no time. Ready to create high converting content?